The team over at Kinevia came up with a free iPhone and iPod Touch app that would act as your guide and cab driver in your own city. With MetrO, all you have to do is install the city from the supported list, and you're off. 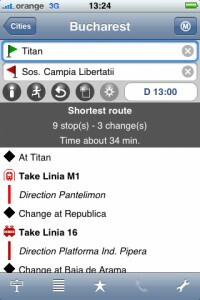 The app doesn't require an internet connection after installing the city, and it puts at your disposal routes, maps and every means of transportation such as buses, trams and subway stations. Once you start the app, you'll be presented with the list of supported cities, and, you'll have to install the ones you will be using the app with to get around. You will need an internet connection for this, so make sure you're in range of WiFi, 3G or EDGE. After installing the city, you can start searching routes and navigation maps. You will have to enter a start and an end location (the app has a very useful auto-complete feature) and then the app will search for routes and display two possibilities: the shortest route and the route with the fewest changes between modes of transportation. You can then choose which route to take and you're off. As transportation routes will change over time, MetrO will evolve accordingly and provide you with relevant changes. All you have to do is keep your cities updated in your list of installed cities. And best of all, the updates themselves are free as well. Each city will come with its own description and statistics, including population, information on transport within the city, and, of course, fares for each ticket that is issued. While this may not be such a great piece of information for locals, tourists will highly appreciate having all this at their finger tips. The app is as of now available in English and French, but the team promises updates. It's free to download from the App Store, and there are regular updates for all the supported cities, as well as adding new cities periodically. What do you think of MetrO ? Scroll down for our comment section and let us know!